A walnut and a walnut core having been removed from the outer pithy fruit. Walnuts are not true nuts. A nut is a hard-shelled fruit of some plants. They are an important part of human and animal diets. Many dried seeds and fruits are called 'nuts' in English, but only some are nuts to a botanist. Nuts are made of the seed and the fruit, where the fruit does not open to release the seed. Most seeds come from fruits, and the seeds are released from the fruit. But nuts (such as hazelnuts, hickories, chestnuts and acorns) have a stony fruit wall which keeps the seed inside. In common speaking, many so-called nuts, like pistachios and Brazil nuts, are not nuts in a biological sense. Everyday common usage of the term often refers to any hard-walled, edible kernel as a nut. A nut in botany is a simple dry fruit with one seed (rarely two). The ovary wall is hard (stony or woody) when it matures, and the seed is stuck to the ovary wall. 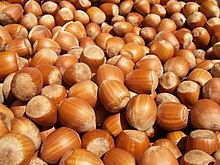 Types of nuts include the oak, hickory, chestnut, stone-oak, birch, and hazelnut. The peanut, coconut, almond, macadamia, pistachio, pecan, walnut and cashew are not true nuts. This page was last changed on 13 February 2018, at 15:02.